Retail tissue in France recorded sluggish volume sales growth in 2018 to reach 616,000 tonnes. Forecasts for the next five years are not much more optimistic. Indeed, retail tissue sales are projected to register a 0.6% volume CAGR over the next five years in the Hexagon. 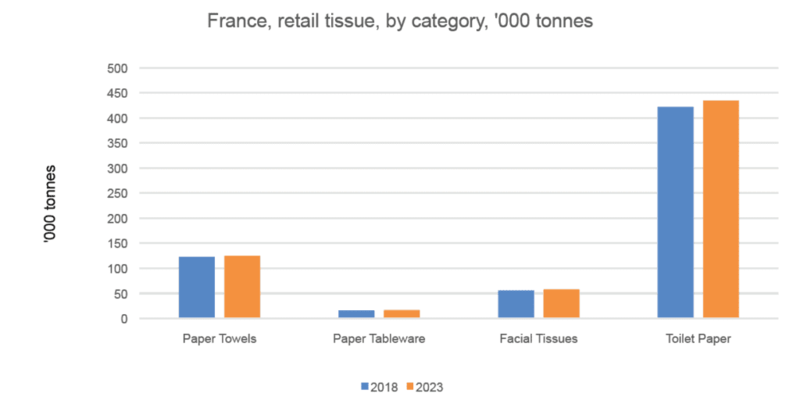 With 9.5kg per capita in retail tissue consumption in 2018, compared to the Western European average of 8.7kg, France is as a mature tissue market. This high per capita consumption means that there is little room for further organic growth and household penetration. In such a saturated market, growth in retail tissue is driven by fundamentals such as population and GDP growth. With that in mind, it should be noted that the country is currently registering slow population growth, with only a slight increase of +0.4% in 2018. Population projections for the next five years through 2023 show a similar trend, with year-on-year growth of 0.3-0.4%. As a direct consequence of the factors previously mentioned, the unmet market potential, ie the extent to which the retail tissue market could grow in the country in the future, remains limited. 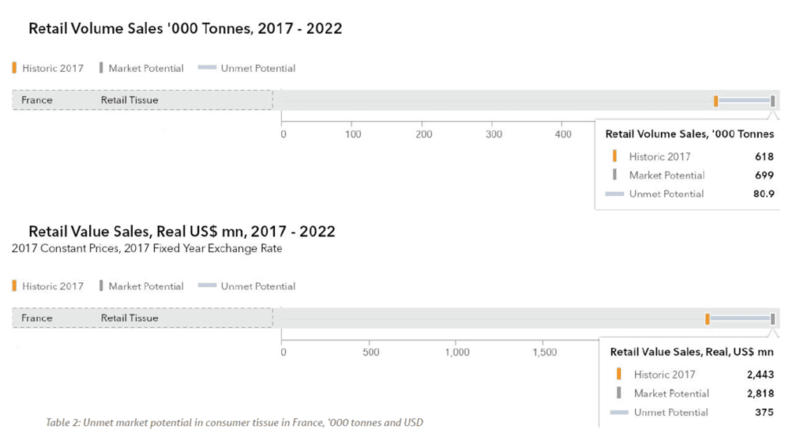 According to Euromonitor International estimates, opportunities for incremental consumer tissue sales in France stand at USD375 million, or about 81,000 tonnes in volume. By comparison, some other countries in the region might offer more room for growth, with estimated potential of USD634 and 189,000 tonnes in Germany and estimated USD573 million and 178,000 tonnes in Italy. As consumer tissue is largely commoditised in France, many consumers often perceive different products and brands as undistinguishable in terms of basic attributes. This notably explains the strong presence of private label in retail tissue in the country, which tend to have a wide variety of entry-level and lower priced products to consumers looking for cheaper solutions. In recent years, however, private label lines have also been developing value-added solutions to fit the needs of consumers who are looking for a combination of price and quality, thereby also competing better with branded products. 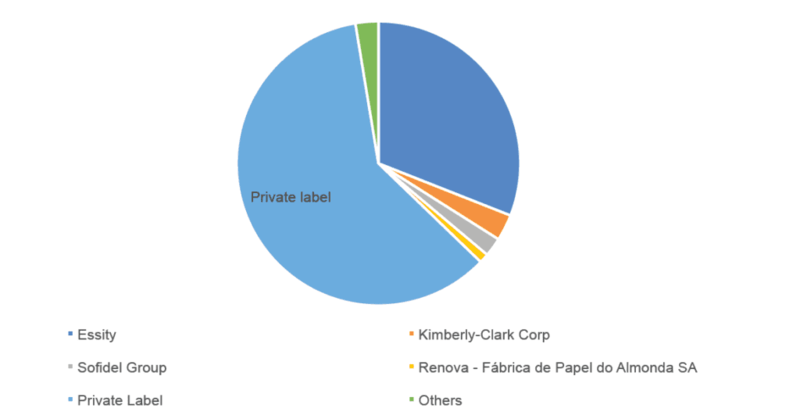 In 2018, private label held a 60% value share of consumer tissue sales in the country. As private label accounts for a major part of the consumer tissue competitive landscape in France, manufacturers of branded products need to continue to focus on meaningful innovation to stimulate consumer demand. Value-added innovation also becomes crucial to support consumer spending in view of price increases implemented by manufacturers across tissue products to compensate for the continuing rise in input costs. Despite many challenges, some factors remain encouraging and could contribute to growth in retail tissue in France in the coming years. Socio-economic factors look rather promising for the coming years in France and are likely to benefit sales of retail tissue in the country. Indeed, GDP per capita amounted to USD42,267 in 2018 and is set to grow at an average annual rate of 1.6% in the forecast period, to reach USD46,008 in 2023. Additionally, the unemployment rate is projected to decrease by 5.5% between 2018 and 2023. Those factors can create additional room for manoeuvre and entice French consumers into buying premium quality tissue products with added-value features and at a higher price point. Some retail tissue categories are projected to be somewhat more dynamic than others, such as for instance, moist toilet wipes. The category is indeed set to register a 20% volume CAGR in the next five years. Lotus has been aiming to disrupt a once lethargic niche occupied by a few modest local players. Since the launch in 2016, Lotus moist toilet paper has revitalised the category, which is positioned as complementary to dry toilet paper and boasts elements of sustainability positioning. In recent years, French consumers have increasingly paid attention to consumer product composition and ingredients, the provenance of materials, as well as the impact of the paper industry on the environment. Consequently, to differentiate themselves and have a positive brand image, tissue players have a growing interest in communicating environmental issues and developing products positioned as more eco-friendly. Integrating sustainability into key strategies and communicating will become even more important to both consumers and the industry. Euromonitor consumer surveys conducted in 2017 indicated that 37% of French consumers considered “environmentally/ethically conscious” an influential product feature in household essentials, and 22% of respondents indicated a willingness to pay more for products positioned as “environmentally/ethically conscious”, indicative of opportunities for the industry to drive innovation and consumer communication in environmentally friendly tissue products. The latest innovations in sustainable products include a new private label line from Casino, the fifth largest grocery retailer in France. In late-2017 the retailer introduced a new product under its “La Bonne Idée!” private label line – a toilet paper without a tube. The traditional cardboard tube is replaced by a smaller toilet paper roll. Similarly, at the beginning of 2018, Lotus eliminated cardboard tubes from its new Moltonel products. According to Essity, this innovation reduces waste – both in terms of tube and packaging – by 60%, and CO2 emissions by 5%. In addition to product innovation, tissue players are increasingly set to communicate on sustainability. FSC-certification is likely to be increasingly emphasised, whether it is on companies’ websites or directly on the product packaging. Finding growth through meaningful innovation and relevant communication strategies Overall, the market conditions in France remain difficult for consumer tissue, and significant opportunities for organic growth are limited. The growth in branded product sales is further constricted by the high level of private label penetration, which put additional pressure on pricing. However, despite saturation and commoditisation of consumer tissue, many French consumers are willing to embrace innovation if it is meaningful and adds tangible value to the products and their experience with the products. The latter will become even more important as price increases in Western Europe will likely gain momentum in the coming years. Sustainability in all its forms is one path that can help product manufacturers to stand out and drive value, especially in view of some consumers’ willingness to pay more for such products. From sustainable manufacturing practices to meaningful changes to product attributes, including fibre sourcing, the “green” trend creates opportunities for product differentiation and higher price points in consumer tissue. These need to come with relevant consumer communication strategies to convey product benefits and thus to attract and retain consumers. 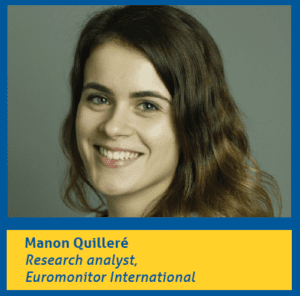 Share the post "Retail tissue in France: finding pockets of growth in a highly mature market"